Jagriti Yatra is an annual train journey that that takes hundreds of India’s highly motivated youth (with some participation of international students) on a sixteen day national odyssey, introducing them to unsung heroes of India. I was fortunate to attend Jagriti Yatra 2011 and would be sharing my experiences during this life changing journey. 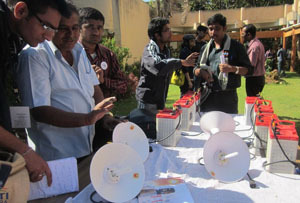 December 24, 2011: Convention Hall, Indian Institute of Technology, Powai, Mumbai. Padma Bhushan Dr. R A Mashelkar addresses a gathering of about 450 yatris. The yatris of Jagriti Yatra 2011 comprises of people from 26 nations all over the world and 23 states in India. The demographic diversities are in the forms of age, gender, language, culture, tradition, literacy level and also the mindset of people. Dr. Mashelkar talks about the power of youth and the need to channelize them. Jagriti Yatra is organized by Jagriti Seva Sansthan, an NGO with headquarters in Deoria, UP and executive office in Mumbai. The Yatra is a sixteen day train journey of India to awaken the spirit of entrepreneurship . The vision of Jagriti Yatra is to inspire young Indians living in the middle of the Indian demographic diamond to lead development by taking to enterprise. By doing so, they can turn from being job seekers to job creators. With cakes and Christmas carol post midnight, begins the Yatra from Lokmanya Tilak Terminal. The train reaches the twin city of Hubli and Dharwad in Karnataka on December 26th. In Dharwad located is Solar Electric Lighting Corporation (SELCO), the leading solar equipment manufacturer and technology firm of India. SELCO was founded by Harish Hande, an IITian with a Phd in Energy Engineering from University of Massachusetts. At the auditorium of University of Agricultural Sciences, Dharwad, the founding members of SELCO talks about the journey of this social enterprise since 1995. SELCO has championed the cause of sustainable energy for small vendors through microcredit. The same day we also visit a village in the district whose face the organization has transformed. The villagers give due credit to SELCO for bringing the light of development. Next stoppage of the Jagriti Express is Bangaluru. The Yatris reach the headquarters of Infosys Limited in the early morning of 27th December 2011. The day begins with a session by Prof. Nandini Vaidyanathan, founder of CARMa and who has been a faculty at many premier Business schools including IIM Bangalore. She talks about the role of a mentor in starting an enterprise and the three key elements of entrepreneurship i.e. Knowledge, Skill and Attitude. She explains how a mentor’s hand holds an infant organization and helps it grow with the help of his experience and network. 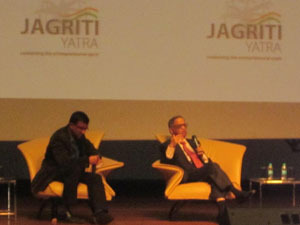 Post lunch, the founder of Infosys Limited Sri N R Narayana Murthy himself addresses the Yatris. He talks about his journey as an entrepreneur and the importance of social values in the organization. To one of the queries asked by a Yatri about his succession planning planning for Infosys, he says that “Infosys is like my daughter. Giving up the chairmanship of Insosys is like giving away of your daughter to a young man who promises to take care of her for the lifetime”. This interactive session is followed by a panel discussion by the founders of Redbus.in (Mr. Phanindra Sama), Babajobs.com (Mr. Vir Kashyap) and Ekopay.com (Mr Abhinav Sinha). The topic of discussion was “Technology Startup and its Social Impact”. No doubt, they have been transforming the way business is being carried out. Redbus has been making public road transport through easy access of reservation system and better utilization of capacity. Babajobs is an online and mobile portal on the lines of Naukari.com, but for blue collar jobs. Ekopay.com has pioneered the micro financing, saving and credits. It also provides a very easy way of money transfer to the locations which are untouched by modern banking system. On 28th December, the train reaches Madurai for Aravind Eye Care visit. Aravind is more than an eye hospital. It is a self funded social organisation committed to the goal of elimination of needless blindness through comprehensive eye care services. It treats 40 % of the free patients from the revenue from the paid patients. It is also an international training centre for ophthalmic professionals and trainees who come from within India and around the world. The founders talk about the vision of Dr. Govindappa Venkatswamy, founder of Aravind Eye Care, who despite his physical disability, championed this social cause. Driven not just by passion but by compassion, Dr. V. wanted to reach out to everyone in need. Numbers were and still are critical. This pushed Dr. V to think out of the box and implement efficient systems that reduced costs and time. He took inspiration from the Mc Donald‟s model of delivering quality to a huge quantity. 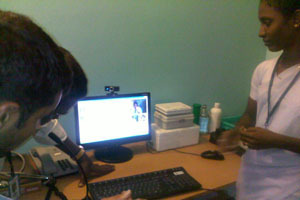 The Yatris visited several villages where Aravind Eye Care has been treating patients through Tele-medicine. The small ailments are cured by paramedical staffs in consultation with the doctor, which those needing a surgery are sent to the main hospital. The Visit to Aravind Eye Care demonstrates the importance of financial self sufficiency for a social organization to sustain itself. proves that infographic don’t have to be complicated to work. ahh real good anyone this chacked work.